Lock in a great price for Quality Inn & Suites Vestal – rated 8.5 by recent guests! Breakfast was delicious. The (blonde?) man at the front desk Sunday morning was very attentive. Told us good morning and ask how we were doing on our way to Breakfast and ask how it was on our way back to the room. He gets 5 starts in my book. Our room was clean and comfortable. Last minute Ute booking do to confusion with an on-line mix up. Reception were friendly and room was a good size with cozy beds. Location is easy access to highway to many attractions around the area. The room was large and the shower worked well. Extra towels were provided. Coffee was provided in various areas of the motel. Friendly staff. Good facilities and comfortable room. Good breakfast. The staff was great. Heated pool was clean and refreshing. Everything was great. Just a little loud in the morning. That being said, this is a very, very busy hotel. The staff was very friendly and helpful. The room was very clean and the bed and pillows very comfortable. 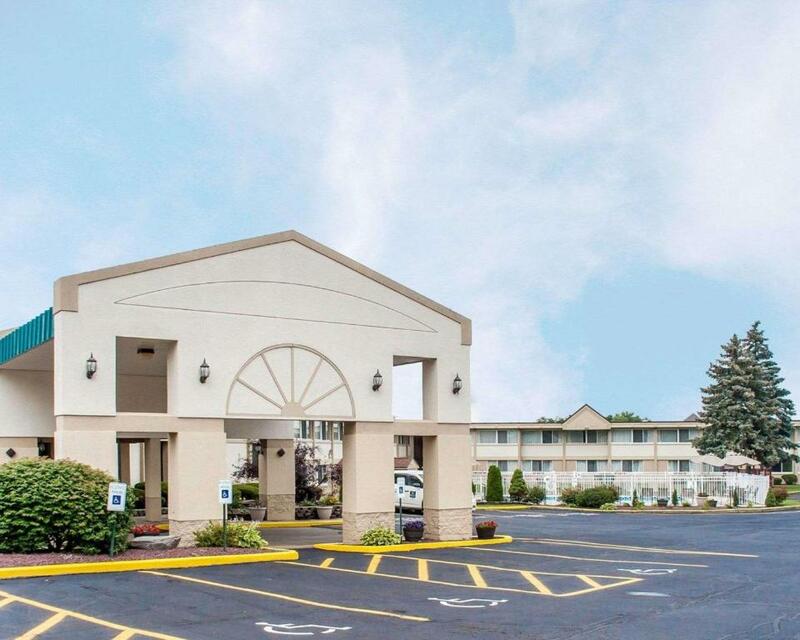 Quality Inn & Suites Vestal This rating is a reflection of how the property compares to the industry standard when it comes to price, facilities and services available. It's based on a self-evaluation by the property. Use this rating to help choose your stay! The Quality Inn & Suites hotel is next to the Binghamton University campus, part of the State University of New York (SUNY). Popular attractions like the Broome County Veterans Memorial Arena multipurpose venue, Davis College, the Greater Binghamton Airport and the Binghamton Zoo at Ross Park are all minutes from this hotel. New York's Finger Lakes Region and several ski slopes are a short drive away providing a wonderful backdrop for a variety of outdoor recreational activities like boating, fishing or hiking. A number of golf courses and parks are also available in the area. The Oakdale Mall is less than three miles from the hotel with a wide selection of retailers, specialty shops, entertainment venues and eateries. Stop by the full-service restaurant or cocktail lounge for a relaxing meal or refreshing drink after a busy day. Room service is also available. 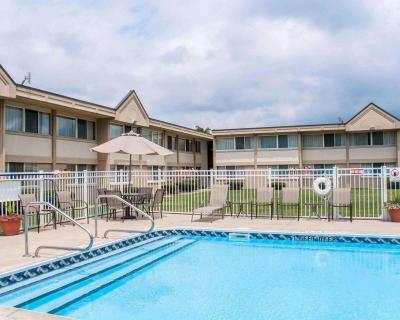 As a guest of this hotel, you can take advantage of amenities and features, including: free wireless high-speed Internet access, free weekday newspapers, a seasonal outdoor pool and exercise room. This is a pet-friendly hotel (fees apply). The business center offers conveniences like a public computer with Internet access and copy and fax services. There are also banquet and meeting facilities that can accommodate up to 80 people for most business or social events. In addition to standard amenities, guest rooms have coffee makers, hairdryers, spacious work desks, irons, ironing boards and cable TV. Rooms with microwaves and refrigerators are also available. Guest laundry facilities and valet cleaning services are available for added convenience. Ample free parking is available and can accommodate most cars, trucks or buses. When would you like to stay at Quality Inn & Suites Vestal? A flat-screen cable TV, microwave, and refrigerator are included in this room. This double room has a tile/marble floor, microwave and sofa. House Rules Quality Inn & Suites Vestal takes special requests – add in the next step! Quality Inn &amp; Suites Vestal accepts these cards and reserves the right to temporarily hold an amount prior to arrival. I liked the bedding and the tv. The bed was a little too firm for my liking. Outlets we're so worn that my curling iron and hair dryer plugs didn't stay in well. Had to keep putting them back in the outlet. Breakfast was a major disappointment. It really was a continental breakfast with eggs. The presentation of the food was messy and unappealing. The pillows were very uncomfortable and the doors and walls carried every sound. When people walked by the room it sounded like they were in the room. The bathroom was leaking water through roof & had leaks all over the hallway outside the room. The staff seems to be least bothered by the leaks through leak which is not just filthy but risky for customers as there are electric equipment attached in bathrooms. Giving 10% discounts should not be the answer by the staff but to fix the issue right away. Got the room at the end, so a long long walk! well organized room and facilities. Friendly staff. The beds are too high. We came for Binghamton University admission. Since the Quality Inn Hotel is very close to BU, we could sucessfully completed the admission process & other fromalities in time. Close to the University, Value for the money & great guidance rom the staff. Overall our experience with Quality Inn was EXCELLENT !!!. The bed was a little harder than I prefer. The bathroom plumbing was a little noisy.